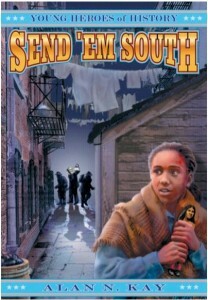 “Alan N. Kay s book, Send Em South, provides the teenage reader with an accurate feeling of the climate of prejudice in pre-Civil War America. The story doesn’t just address the institutional problem of slavery, but touches profoundly on the commonly held prejudices against the Irish as well…This story tells how David, an Irish boy from Boston, and Lisa, an escaped slave from a Georgia plantation, come to the realization that they actually have quite a lot in common. Both are ostracized by society because of their backgrounds, and in many respects are treated as less than human. “…(Send ‘Em South) is an exciting story about a dad and daughter whose love demands sacrifice, and a tribute to the bravery of two young people who manage to push past the hatred and danger swirling around them. “…The narrative moves right along in this book, thrilling the reader with harrowing escapes and a sense of danger. Many times, the story of slavery and the Civil War seems like the story of adults fighting against each other. This book does a good job of relating just how big a part kids played in that part of American history. I also liked the ending, which was not at all what I was expecting, based on the events leading up to it. “I have to admit that I am a big fan of historical fiction, and reading Send ‘Em South, the first book in this series, has made me a fan of Alan N. Kay, too….Send ‘Em South is gripping and action-packed, yet it still manages to be rather touching at times. Middle school kids can empathize with their plight, and this gives the book its impetus for making history come alive, a virtue which history teachers know is largely elusive…These books can be used for more than just history classes. English and reading teachers might find them to be good materials for their classes, too. I do want to point out that the language in these books reflects the reality of the era. Any of you who feel that Huck Finn should be excluded from the classroom because of certain words will feel the same way about this series. The rest of us can simply delight in these stories, well-told, which can spur our students on to greater knowledge and a more personal grasp of the Civil War.” — Terry Orr, Webmaster, Teacher Information Network, http://www.teacher.com, December 2001.